ID: Orange stalk and tentacles. Four rows of tuned feet along stalk. Long, carrot shaped body. 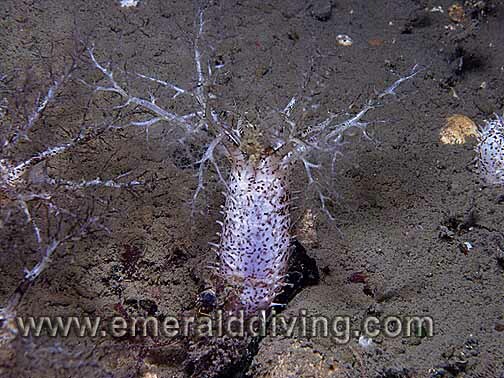 Comments: Burrowing sea cucumbers are common inhabitants of rocky reefs in Washington waters. Also called orange sea cucumbers, these aninals at least partially bury their stalk where ever they can establish a firm foothold. I have noted these cucumbers in areas with light to heavy current. ID: White stalk and 10 white tentacles. Dark spots on stalk. Comments: I rarely note this sea cucumber, possibly because I don't pay enough attention to sea cucumbers. 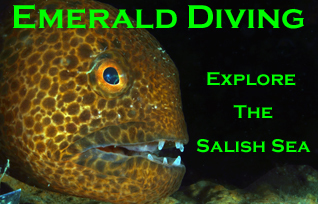 I most often note this species throughout the San Juans Islands on reefs subjected to heavy current. This photo was taken at Strawberry Island, which can be a very current intensive site. ID: Red, orange or white body (often times various colors) with numerous pointy protrusions. Tube feet. Comments: The red sea cucumber seems ever-present when diving the Northwest. This animal expels a portion of its gut when threatened as a defense mechanism. I have noted completely white specimens on very rare occasions. 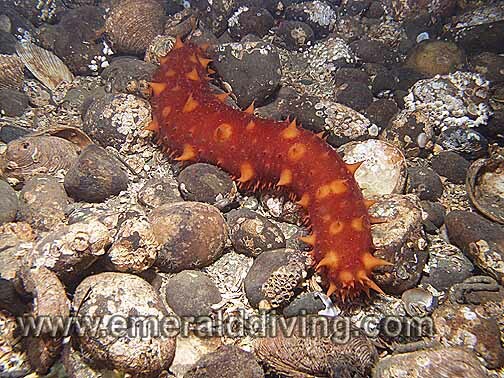 The red sea cucumber is also referred to as a California sea cucumber. ID: Armored, dome shaped body. Orange tentacles. Tube feet on the underside of the body. Comments: I often note this fliter feeder growing in dense colonies along current swept walls and reefs. 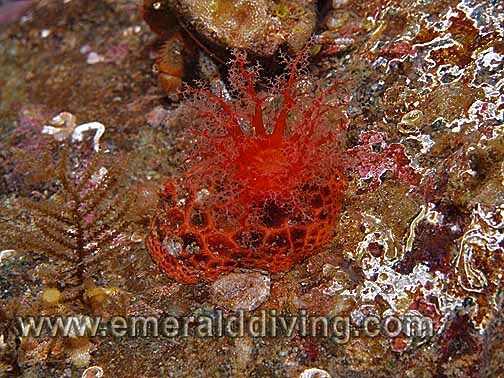 Although small in stature, the slipper sea cucumber can dominate certain rocky area and make the substrate appear red. ID: White colored stalk and tentacles. 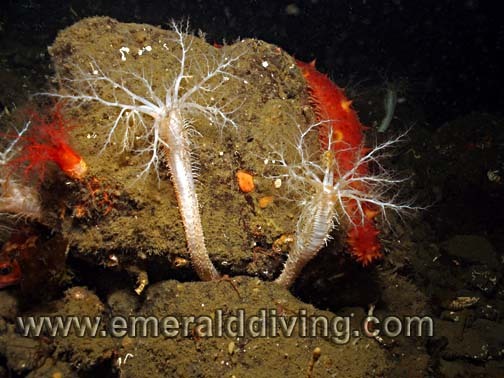 Very similar to the orange sea cucumber, except white in color with less �bushy� tentacles. Comments: The white sea cucumber is redily abundant in sections of Hood Canal. 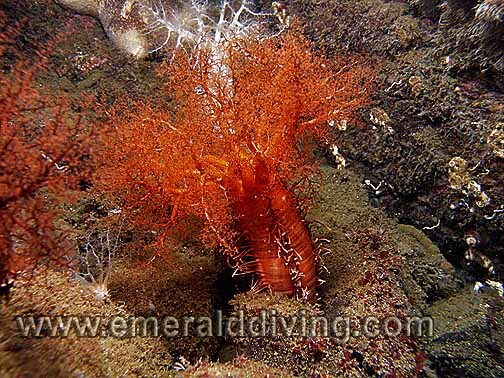 Like the orange and peppered sea cucumbers, it attaches its stalk in a crevice on the reef and filter feeds. Why go out for dinner when the current will deliver for you? 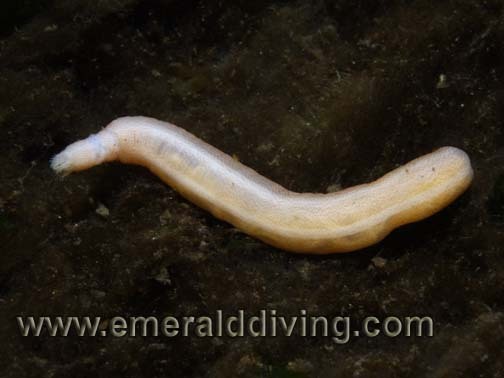 ID: Worn-like appearance with feeding tentacles at one end (sometimes withdrawn). Five white muscle bands visible through skin. Comments: This unusual sea cucumber looks more like a worm, but you can clearly see the feeding tentacle on this specimen on the left. I don't note this species often, but it is typically found eel-grass beds. Photographed at Three Tree Point in 15 feet of water.